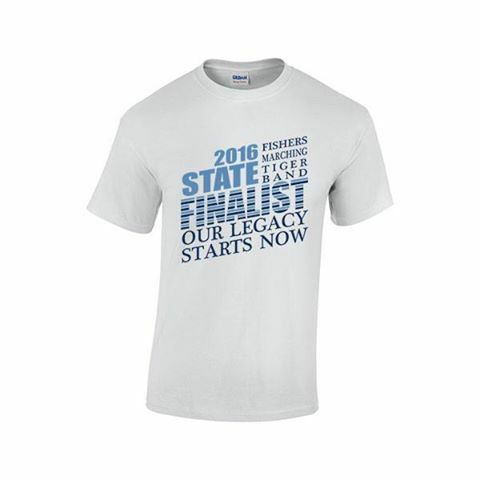 STATE SHIRT ORDERS ARE IN! Friday, 10/28 from 5:15 p.m. – 6:00 p.m.
Saturday, 10/29 before and immediately after the huge State Spirit Send-Off. Specifically, from 10:45 a.m. – 11:15 a.m. and then again from 11:45 a.m. – Noon. You can find us either just inside or outside Door 9, depending on the weather. See you then! GO TIGER BAND! If you have any questions, please contact the Spirit Wear & Garage Sign Committee at spiritwear@fishersband.org.